Compact Vulcanizer, fast and easy to install. - Easily removable divided into 5 parts, reducing the weight load for the operator. - Fast and automatic process. - Low height frame for workspaces with difficult access. Heating Heating elements - 185º C (365º F) Max. Technical data with metric system correspond to the 16º models, and with imperial system to the 22º ones. The weight of the lower frame includes the bolts and the pins. The total weight includes the 2 heating platens and the pressure bag. Compact press made in aluminium. 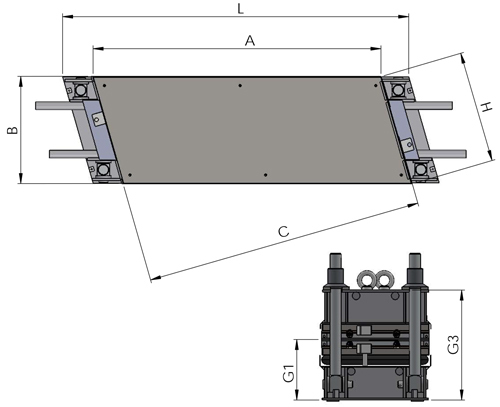 Available for several belt widths, from 650mm up to 1600mm. Lengths of platen 365mm, 522mm, 627mm and 728mm (14”, 21”, 25” y 29”). The vulcanizer includes pneumatic pressure system, heating system and cooling system. Removable divided into 5 parts (top frame, top platen, bottom platen, pressure bag and bottom frame) for ease of handling. Completely automatic process programmed from control unit (heating, dwell time and cooling). Easy to program control unit. Automatic control of the whole splicing process once the melting temperature of both platens, the dwell time, the cooling temperature and the pressure have been set. The control box features an Automatic Temperature Regulation System (ATRS), that monitors automatically the differences of temperature between the heating platens during heating and dwell time. By doing so, differences of more than 2ºC are avoided. Includes voltmeter for input voltage reading that allows to detect any problem in the power supply. Includes also a pressure regulator, manometer and pneumatic valve with quick inflation and deflation. Automatic end-of-cycle buzzer. The pressure is applied to the belt by means of a pressure bag. 7 bar (100PSI) maximum pressure. Fast heating of both platens by means of silicone heating elements. Each one is made with an asymmetrical winding to supply an even heat distribution all along the belt. The elements get warmer on the ends to compensate the loss of temperature and avoid heat concentration in the middle. Temperature programable up to 200º C / 392º F.
Water cooling system composed by a closed stainless steel circuit, that help circulate water all along the platens propelled by a water pump. Water favours a rapid temperature reduction of the belt and reduces waiting time for a new use of the press. It activates automatically at the end of the dwell temperature process. Perfect assembly of the top and bottom frames. Steel made. Easily adjustable to different belt thicknesses. Steel made with safety factor 2 (capable of withstanding twice the maximum load pressure of the press). Easy to program control unit. Automatic control of the whole splicing process once the melting temperature of both platens, the dwell time, the cooling temperature and the pressure have been set. The control box features an Automatic Temperature Regulation System (ATRS), that monitors automatically the differences of temperature between the heating platens during heating and dwell time. By doing so, differences of more than 2ºC are avoided. Includes voltmeter for input voltage reading that allows to detect any problem in the power supply. Includes also a pressure regulator, manometer and pneumatic valve with quick inflation and deflation. Case with electrical leads, water hoses and the rest of tools required for the use of the vulcanizer. Submersible Pump, for the cooling of the heating platens (water tank not included). Portable Water reservoir for cooling. 19.5 litres of water reservoir to boost water through external compressed air. 10 Bar Piston Compressor of small size, with monobloc head, heat protector, fit coupling and pressure reducer.